Tempeh is made from fermented cooked soya beans. It is very popular in Indonesia and other Eastern countries. The firm texture and slightly nutty flavour makes tempeh a flavoursome alternative to tofu. To make the marinade, mix the first 4 ingredients (shoyu or tamari, water, garlic and vinegar). Add the tempeh cubes and bring to the boil and continue to boil for another 3 minutes. Next, drain the tempeh. In the meantime cook the noodles according to the instructions on the package. Drain the noodles and tempeh and add pesto sauce. 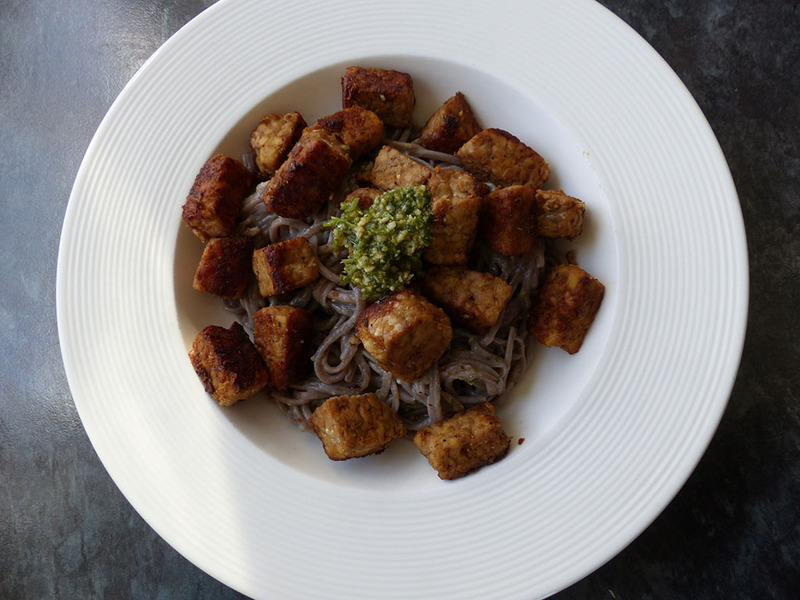 Serve the tempeh with noodles while still hot. Serve with mixed salad leaves and a simple dressing of 1tbsp olive oil and 1 tbsp white wine vinegar.